Sharp QT-8D with stylised "Itron" vacuum fluorescent display, with half-height zero, showing 12345670. 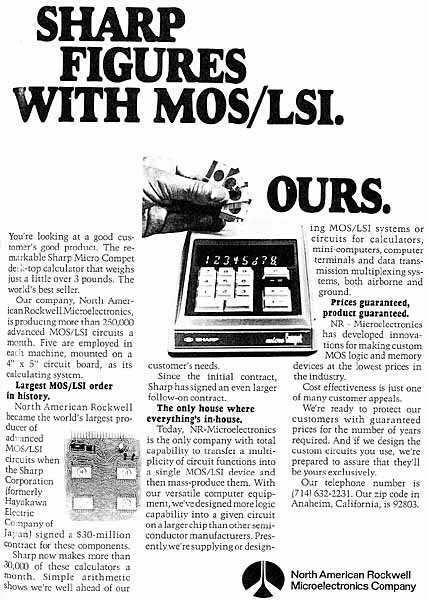 Distinctive features: The first calculator to use MOS LSI (Metal Oxide Semiconductor, Large Scale Integration) integrated circuits. The first calculator to use a vacuum fluorescent display (VFD). Was the smallest electronic calculator at the time. Display is 8 digits, newly developed green VFD (Vacuum Fluorescent Display) "Itron" tubes. Semiconductors: uses five MOS LSI integrated circuits manufactured by the Autonetics division of Rockwell. "Has four MOS/LSI chips and a clock generator. Each chip contains 900 MOS transistor equivalents.". See below for further information on the development of this model. 245 x 132 x 70 mm. (9.6" x 5.2" x 2.75"). Price, in September 1970 US$395. 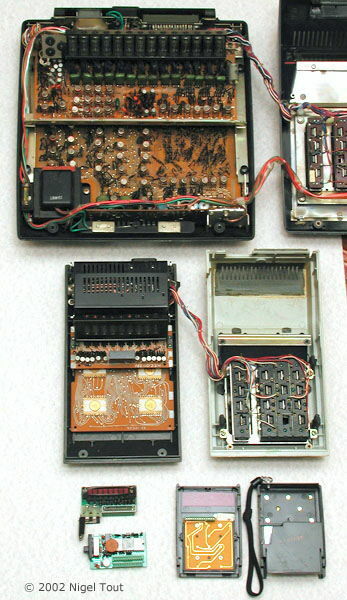 By replacing the power supply circuitry of the QT-8D with rechargeable cells Sharp produced the QT-8B, one of the first battery-powered electronic calculators. The newly developed Itron VFD display tubes. One of the reasons for having a display with half-height zeros is that there is no leading-zero suppression. The half-height zeros then make the display more easily readable. The calculator opened. On the left are the display board and the calculating board, which both plug into a two-slot socket. Here the display board has been unplugged to reveal the whole of the calculating board with the four Rockwell Large-Scale Integration (LSI) integrated circuits. The clock-generator integrated circuit has a star-shaped heat-sink clipped on. Although the U.S. semiconductor manufacturer Texas Instruments (TI) first demonstrated a prototype electronic calculator, called the "Cal-Tech", using this technology in late 1966, the company was not ready to move into the consumer electronics market, remaining a component manufacturer. A team of system design engineers, headed by Yukihiro Yoshida, was sent to Rockwell where, with the support of Rockwell's design capability, they set about implementing the required set of MOS-LSI circuits by using the four-phase MOS dynamic logic which was originally developed by Rockwell. After a few years of hard work the design team succeeded in developing a LSI calculator, the Sharp Compet QT-8D, based on just four MOS-LSI chips produced by Rockwell. This was manufactured in the Nara factory, in Japan, and put on the market in August of 1969. This time there was a drastic reduction in price to 98,000 yen (US$270), weight to 1.4Kg ( pounds), and power consumption to 4W (using 4 MOS-LSI's and an 8-digit display using VFD tubes). 'Ever since word leaked out that the Autonetics division of the North American Rockwell Corp. had been picked by Japan's Hayakawa Electric Co. [renamed Sharp Corporation in 1970] to supply large-scale integrated MOS arrays for a 3-pound calculator, the U.S. electronics industry has been buzzing with wonder—and skepticism. Typical is the reaction of a source at another company working hard on MOS products: "We feel Autonetics has a long row to hoe. Without faulting their technical ability, the Hayakawa contract calls for high-volume production with low unit prices. Not many in the industry have done this in MOS, and Autonetics doesn't have a history of being a high-volume, low-cost producer. Hayakawa will be pushing to get prices down, and we're not convinced Autonetics can do it." The rewards, if all goes well for Autonetics in this venture, should be substantial. A source close to the situation estimates that the initial order could lead to additional business worth about $80 million over the next few years from Hayakawa alone. Autonetics officials decline to assign a dollar value to such prospects, but Eyestone [S. Fred Eyestone, president of Autonetics] observes: "It's reasonable to say that we've talked with Hayakawa about supplying MOS to products beyond the QT-8D calculator. 'Discussions leading to Autonetics' contract to deliver more than 2 million MOS LSI arrays, of five different types, for Hayakawa's QT-8D calculator began some 10 months ago. Worth $30 million, the award specifies that shipments begin in May and reach a peak of 160,000 units a month; it covers Autonetics work until January 1971. Thereafter, Hayakawa will produce the circuits itself in Japan under the terms of a technical-assistance agreement. 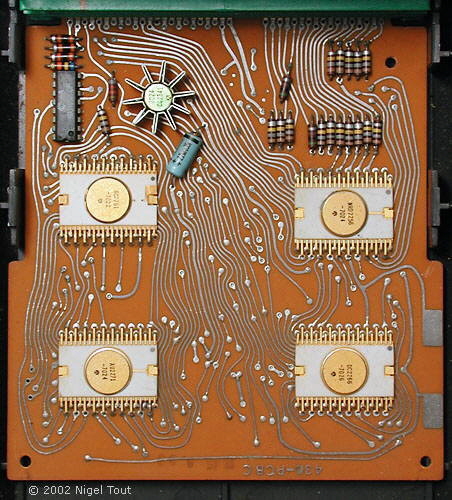 One circuit interfaces between the calculator's functional MOS electronics and its input-output electronics. A second generates the logic functions for the calculator's automatic floating-point feature, while another performs the basic binary-coded-decimal functions, generating most of the control signals for the three other logic circuits. A fourth generates the macromode control signals associated with the calculator's functional keys. All are housed in Autonetics' new 42-lead package. The fifth circuit, packaged in a metal can, generates the multi-phase clock signals required by the four logic circuits. 'Autonetics is finally delivering MOS LSI circuits for Hayakawa's desk calculators after the Japanese company flatly rejected all circuits produced by the American firm during July and August. The reason: high rejection percentage among tested arrays made Hayakawa leery of using any. Autonetics considers the $30 million order its entree into the commercial LSI business. But shipments are now rolling in, says Hayakawa, adding that an engineer sent to Autonetics to supervise acceptance testing returned to Japan with a big batch of circuits. The problem apparently was created in going from 1.5-inch to 2-inch wafers—diffusion conditionsevidently had to be changed. Hayakawa emphasises that it's confident Autonetics has everything under control. Apparently, the Autonetics division of Rockwell was eventually very successful in supplying the chips for the Sharp QT-8D, the hand-held Sharp QT-8B, and following calculators. Rockwell went on to be a major supplier of chips for calculators, and also manufactured and marketed its own calculators until the mid-1970s when it decided to exit the consumer electronics market. 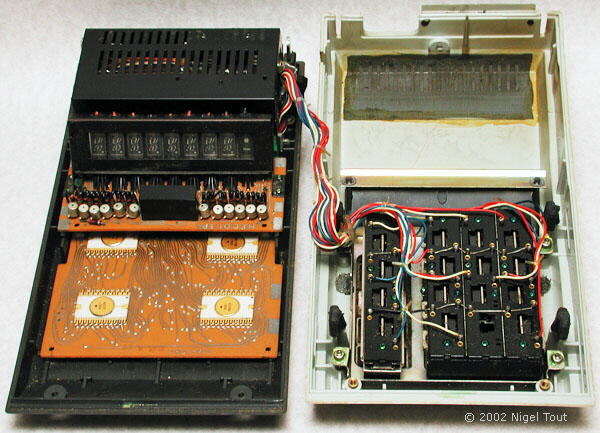 The Sharp QT-8D also saw one of the first uses of a VFD (Vacuum Fluorescent Display) pioneered by Sharp, which is a lower voltage, lower power consumption alternative to the then common "Nixie"-type cold cathode tube. The VFD uses multiple anodes with fluorescent coatings. A further reason for the development of the VFD in Japan was the high royalty demanded by Burroughs on each of its "Nixie" tubes sold there. Advertisement for the Rockwell chip set used in the Sharp QT-8D, from September 1970. Advertisement for the Sharp QT-8D from October 1969. A version of the Sharp QT-8D made for sale by Addo, by then owned by Electrolux of Sweden. The use of a floating point allowed the display to be limited to 8 digits, which provided a drastic reduction in the width of the calculator. 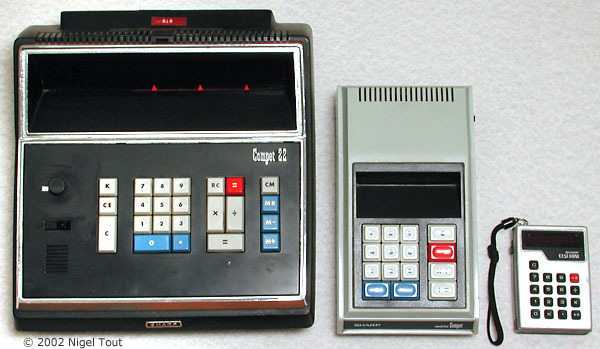 Most of the contemporary calculators using MSI integrated circuits had fixed decimal points and so required more digits in the display to make them practical for many applications. 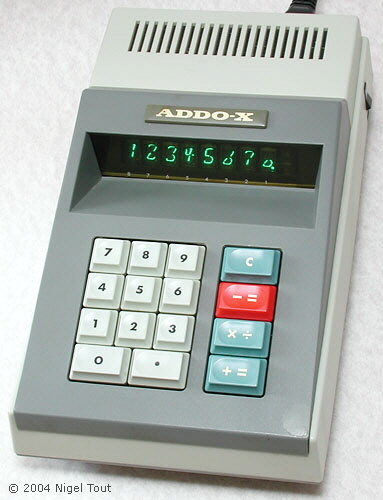 The small size and reduced power consumption of the QT-8D further allowed the development of a hand-holdable version using batteries, the QT-8B—one of the the first purely battery-powered electronic calculators. 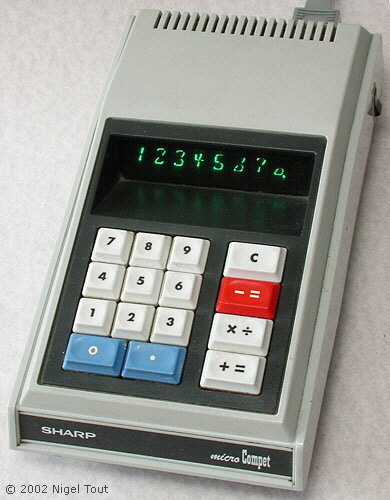 Sharp were pioneers in the field of calculator electronics starting with the CS-10A, one of the first transistorised electronic calculators in 1964. There is more information about the company and its innovative calculators in the Companies section of this site. From left to right, Sharp Compet 22 of 1968, Sharp QT-8D of 1969, Sharp EL-801 of 1972. The photographs above and on the left illustrate the size reduction over about 4 years made possible by developments in integrated circuits. Nations Business, October 1970, pp48-49. Curran, Lawrence, "Autonetics arrays its MOS forces", Electronics, April 28, 1969, pp103-105. "Autonetics delivering Hayakawa MOS LSI after cold summer", Electronics, September 15, 1969, p47. "U.S. firms gird for calculator battle", Electronics, November 23, 1970, pp83-84. "Japanese nix high royalties for Nixie tubes", Electronics, June 26, 1967, pp203-204.